"She always wears the trendiest outfits. For instance, at our last meeting she was wearing layers - a shocking-pink tunic over a white shirt with pink and yellow umbrellas printed on it. Over the tunic was a wide, low-slung yellow belt with a pink plastic buckle. The shirt, but not the tunic, was tucked into a pair of black knickers, and below the knickers were yellow stockings. Then there's her hair. Claud's hair is something else. Her family is Japanese-American, and Claud has this shiny, black hair. But her hair isn't just shiny and dark, it's long. And Claud can find a million ways to wear it. At that last meeting, she had divided it into five braids and had woven pink and yellow ribbons into the braids." "Same old Claud, I thought as we trudged up our front steps. Her hair was flowing down her back, pulled away from her face by a headband with a huge pink rose attached to it. She was wearing a long, oversized black-and-white sweater, skin-tight black leggings, pink-and-black socks, and black ballet slippers. Her jewelry was new, and I could tell she'd made it herself. You know those things about a best friend. Her necklace was a string of glazed beads that she'd probably made in her pottery class. And from her ears dangled an alarming number of plastic charms attached to gold hoops." "At the moment I'm wearing lavender plaid cuffed pants with suspenders over a green shirt with buttons down the front, a matching lavender beret (and not just because I'm at my easel), and fleece-lined, high-top sneakers which I must admit are uncomfortably hot, but they look great. Also, I've got on earrings shaped like Christmas tree lights that actually blink on and off. I'm not sure why I chose to wear them, since it's nowhere near Christmas, but I love jewelry, like to make my own sometimes, and have pierced ears." "It's her clothes that amaze me, though. (I think they amaze everyone.) Claud mixes and matches the weirdest stuff and comes up with the coolest outfits. Like a loose blouse with a fake coat of arms on it worn over a very short black skirt. Around her waist, a scarf. On her feet, short black boots. Dangling from her ears, dinosaurs. And her hair might be piled on top of her head and held in place with hairpins that look like seahorses. She combines all this stuff - and she looks fantastic." "Claudia also loves fashion, and you should see her clothes. They are amazing, always wild. Like, she'll wear a miniskirt, black tights, push-down socks, high-top sneakers, a shirt she's painted or decorated herself, and big earrings she's made. Her hair might be pulled into a ponytail and held in place with not one but six or seven puffy ponytail holders, a row of them cascading down her hair. I'm always fascinated by Claudia." "Claudia was wearing another of her great outfits. This one consisted of an oversized, short-sleeved cotton shirt with gigantic leaves printed all over it, green leggings - the same green as the leaves on her shirt - bright yellow push-down socks, her purple high-tops, and in her hair a headband with a gigantic purple bow attached to one side. Claud is so, so cool . . . especially compared to me. I was also wearing an oversized shirt - a white sweat shirt with ballet shoes on the front - but with it I was just wearing jeans and regular socks and regular sneakers." "Nobody, but nobody, dresses like Claudia. At least, nobody in our grade. (We used to have a friend, another member of the Baby-sitters Club, named Stacey McGill, who dressed kind of like Claudia. But Stacey moved back to New York, where she used to live. And anyway, trust me, Claudia is unique.) The best way to get this point across is to describe to you what Claudia was wearing at lunch that day. It was her vegetable blouse: an oversized white shirt with a green vegetable print all over it - cabbages and squashes and turnips and stuff. Under the blouse was a very short jean skirt, white stockings, green anklets over the stockings, and lavender sneakers, the kind boys usually wear, with a lot of rubber and big laces and the name of the manufacturer in huge letters on the sides. Wait, I'm not done. Claudia had pulled the hair on one side of her head back with a yellow clip that looked like a poodle. The hair on the other side of her head was hanging in her face. Attached to the one ear you could see was a plastic earring about the size of a jar lid. #10: Logan Likes Mary Anne! "In the junior department I tried on a green sweater dress that made me look like a mermaid, and a yellow sweater dress that made me look as big as a house. Then Claudia handed me a full white skirt with the words Paris, Rome, and London, and sketchy pink and blue pictures of the Eiffel Tower, the Tower Bridge, and other stuff scrawled all over it. She matched it up with a pink shirt and a baggy pink sweater. I would never, ever have tried on that skirt, but with the shirt and sweater it looked really cool. In the shoe department we found white slip-ons with pink and blue edging that matched the pink and blue in the skirt. I'd never have looked twice at those shoes, either, but with the rest of the outfit they were perfect." "I joined my friends and we walked to the gym in a noisy bunch. We were all smoothing our hair and picking lint from our clothes and fussing with our jewelry. I thought we made a pretty good-looking group. 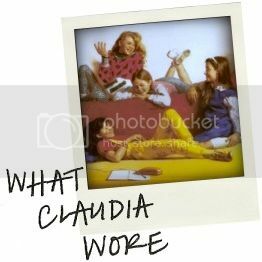 Claudia was wearing short, tight-fitting black pants and a big white shirt that said BE-BOP all over it in between pictures of rock and roll dancers. She had fixed a floppy blue bow in her hair. Stacey was wearing a white t-shirt under a hot pink jumpsuit. Dawn and Kristy looked more casual. Dawn was wearing a green and white oversized sweater and stretchy green pants. Kristy was wearing a white turtleneck shirt under a pink sweater with jeans. We just couldn't seem to get her out of blue jeans." Jesus, Mary Anne, a good pair of jeans can be the starting point for many a fabulous outfit. Who died and made you queen of BSC fashion? & the disgusting way Alan Gray eats a sandwich! That’s right, Dog-eared Books on Valencia & 20th, the haven of hip, is having a Baby-Sitter’s Club reading group (for grown-ups) to celebrate the recently released graphic novels and to appease their dorky kids’ book specialist! Join us on May 1, the first Tuesday in May, at 8 pm, where we will discuss The Truth About Stacey, and we will discover EXACTLY what this truth is, through friendly discussion coupled with beer and snacks (Ho-Hos, Ding-Dongs, and of course carrot sticks for those of us who are either diabetic or from California). Starting a Babysitters Club Reading Group is hard work, but cubbie’s going to do it! For more information, call (415) 282-1901 and reach nine experienced booksellers! " now that is what I'm talking about. The book, adapted by Raina Telgemeier (aka my new hero) can be purchased at amazon. "Anyway, on that busy Wednesday morning, I finished dressing in my favorite art class outfit - black jeans, a giant bright blue t-shirt, and a snake bracelet that I wore above my elbow - and ran downstairs." "Claudia Kishi, our vice president and a junk food addict, was prowling around her room, trying to remember where she'd hidden a large bag of M&Ms. She was wearing one of her usual outrageous outfits: a black leotard and skintight red pants under a white shirt that was so big it looked like a lab coat. Claudia' s a wonderful artist and she had decorated the shirt herself, covering it with designs painted in acrylic. She had pinned her long, black hair back at the sides with red clips." "Mimi knows how much I like to dress up. It's very important to me. I think clothes make a statement about the person inside them. Also, since you have to get dressed every day, why not at least make it fun? Traditional clothes look boring and are boring to put on. So I never wear them. I like bright colors and big patterns and funny touches, such as earrings made from feathers. Maybe this is because I'm an artist. I don't know. Today, for instance, I'm wearing purple pants that stop just below my knees and are held up with suspenders, white tights with clocks on them, a purple plaid shirt with a matching hat, my high-top sneakers, and lobster earrings. Clothes like these are my trademark." "Recently I haven't felt quite as comfortable visiting Claudia as I used to. This year she had to go and start growing up faster than us. She's wearing a bra, and the way she talks, you'd think boys had just been invented. She acts like all the guys in the seventh grade aren't the same goony boys they were last year. Last year, the boys were saying 'want some abc gum?' and then handing us the gum out of their mouths, saying 'it's already-been-chewed, get it?' and laughing hysterically. Last year, the boys were giving us noogies on our arms and throwing spitballs at us. Last year, the boys were pulling our chairs out from under us when we stood up to answer questions. This year (if you listen to Claudia), the boys are heroes. Personally, I don't see any change. I rang the Kishi's bell. Claudia came to the door. She was wearing short, very baggy lavender plaid overalls, a white lacy blouse, a black fedora, and red high-top sneakers without socks. Her long black hair was carefully arranged in four braids. I felt extremely blah compared to her. I was so used to seeing Claudia in outfits like that that I didn't bat an eye. What I did notices was that she was wearing makeup. There was blue stuff on her eyelids, gold stuff above her eyes, and magenta stuff on her cheeks. 'Oh, you just think it's exotic,' said Claudia. Well, maybe I do. Claudia's parents are originally from Japan. They came to the United States when they were very young. Claudia has silky, jet-black hair, dark eyes, and creamy skin without so much as a trace of a pimple. She's absolutely gorgeous. But she has this wild streak in her that makes her buy belts made of feathers and wear knee socks with palm trees on them. Makeup was something new, though."